I’ve made a big decision. I plan to transfer the majority of my taxable money to Betterment. For those who haven’t heard of it, Betterment is an online financial advisor and portfolio manager that has been increasing in popularity over the last few years. Since my decision to hand over the keys to someone else will likely come as a big surprise, I’ll start this story from the beginning. About a year ago, I attended a financial blogger conference in St. Louis. On the first night, I was having a beer with none other than Jim Collins from JLCollinsNH.com when a guy sat down next to me and started chatting to us. After talking for a while, I discovered that the guy was actually the founder and CEO of Betterment, Jon Stein. We had a very interesting discussion and it was evident after speaking with him that he was doing some really exciting things within the personal investing space. During our conversation, Jon invited me to visit their office the next time I was in New York City. Since I was really impressed by him and his company after our chat, I took him up on his offer when we went to NYC last November for the New York marathon (Side Note: Congratulations to my wife for dominating her first marathon; she finished in an impressive 4:17:57!). When I arrived at their Manhattan office, I was greeted by Katherine (who I also met in St. Louis) and was then introduced to their Director of Behavioral Finance and Investing, Dan Egan. As I described in my Cognitive Bias post, people have a tendency to sabotage their own investments so it’s great that Betterment has a behavioral economist on hand to figure out ways to help save you from yourself. According to this article, the behavior gap of Betterment customers (Behavior Gap = Investment Returns – Investor Returns) is 1/5th of that of a ordinary investors so Dan and his colleagues must be doing something right. Next, I met one of their in-house tax experts, an ex-tax lawyer named Boris. I really enjoyed bouncing some of my ideas off of him and it was interesting to hear what Betterment was doing to help minimize their customers’ taxes. Finally, after meeting a few software developers, chatting with Jon again, and talking to a few other employees, I left with an even better impression of the company than I had when I went in. Once I got home from New York, I did some more research into Betterment and I played around with the demo version of their software. The application looked nice and the fact that their portfolio consisted of low-cost index funds (mostly from Vanguard) was great to see but I was more impressed by the things happening behind the scenes. Betterment’s smart rebalancing feature (see this article for more information) was particularly appealing because although I plan to remain primarily in equities, I want to diversify a bit more to take advantage of all the benefits diversification and rebalancing provides (if you want to get dirty with some financial theory, take a look at this math-heavy post I wrote about diversification a couple years ago). Even though I was very impressed with both the company and their software, I still wasn’t ready to invest my money with them (which is why I haven’t written anything about them yet). Although their fees are among the lowest in the space, I wasn’t sure they offered enough extra value for someone like me. Sure, it seemed like a great service for a beginner investor or someone who just isn’t interested in managing their money but I’m the MF-ing Mad Fientist (MF squared) so surely I can do better on my own. A few months ago, however, Betterment released a feature that changed my mind. As I discussed in my Tax-Loss Harvesting article, you can potentially save a lot of money every year by strategically selling and then rebuying investments that decrease in value and then using those losses to lower your taxable income. Implementing a tax-loss harvesting strategy can get a bit complicated though, since you have to keep an eye on the markets, sell investments that have decreased in value, buy alternative investments temporarily until 30 days have passed (to avoid wash sales), and then rebuy your initial investment. Wouldn’t it be great if a software algorithm did all of that for you? That’s exactly what Betterment’s Tax-Loss Harvesting+ (TLH+) does. Rather than get into all of the details on how Betterment does tax-loss harvesting better than anyone else, take a look at this comprehensive white paper to read all about it. allocation (with heavy bond allocation, TLH benefits quickly go to almost zero, since bonds aren’t that volatile). We launched in late June, just about 2 months ago. For accounts >50k but <100k, average harvested to date = $425 For accounts >100k but <200k, average harvested to date = $716 For accounts >200k but <300k, average harvested to date = $1158 For accounts >300k but <400k, average harvested to date = $2089 For accounts >400k but <500k, average harvested to date = $2609 For accounts with 500k+, average harvested to date = $4282. How exciting is that?! Considering I’ve harvested exactly $0 of losses this year, the fact that TLH+ has harvested thousands of dollars worth of losses shows the power of letting an algorithm do something that humans couldn’t (or wouldn’t want to) do! Let’s say that someone with a $150,000 portfolio only harvested the average amount for that range ($716). Assuming this person is in the 25% marginal tax bracket and uses those losses to lower his/her taxable income, those harvested losses would result in $179 less taxes. Compare this to the total added cost of using Betterment’s services for those two months and you see how going with Betterment is a very attractive proposition. The extra losses harvested over the first two months have more than paid for the added fee, plus you still get all the additional rebalancing benefits that I previously discussed. Since I’ll soon be living in Scotland but will still be earning U.S. dollars, I plan to plow the majority of paycheck (i.e. what’s left after maxing out my retirement accounts) into my taxable investing account every month so it will be great to set up automated contributions and know that my asset allocation is being taken care of properly by the smart rebalancing method mentioned above. When I eventually leave my job for good and start withdrawing from my taxable accounts, Betterment will help me perform withdrawals as efficiently as possible (as I described in the Specific Identification of Shares article, it matters which shares get sold when you withdraw from your accounts and Betterment’s TaxMin method sells shares in the correct order automatically). All of these facts have convinced me to finally pull the trigger and move my taxable accounts to Betterment. When our house finally sells, I’ll use the proceeds from that and some additional cash I have laying around to open a taxable account at Betterment. In order to get the remainder of my taxable money to Betterment, I’ll have to sell some investments that have appreciated in value. I obviously don’t want to pay any capital gains taxes in the process so I’ll need to do this gradually and will probably wait until I leave my job so that I can take advantage of a 0% long-term capital gains tax rate. I don’t need to do any rebalancing or tax trickery with my tax-advantaged accounts so rather than incur an additional fee on that money, I’m just going to leave it all where it is. Since I won’t be moving any of my retirement accounts over to Betterment, I’ll need to make sure nothing in those accounts will trigger wash sales. Luckily, most of my current funds differ from the funds Betterment uses so there’s not too much work to do here. I’ll just do a bit of simplifying so that I can easily adjust my holdings if Betterment changes their basket of ETFs. I’m excited to take advantage of the services Betterment offers (there are many other benefits I didn’t even mention so check out Jon’s response on Quora for more). Since only the taxable portion of my portfolio will be invested there, the additional fees I’ll have to pay will be a tiny percent of my total portfolio but I will still be able to take full advantage of the automated rebalancing, tax-loss harvesting, and other services Betterment provides. Moving my taxable accounts to Betterment is a huge departure from how I currently handle my investments so I’m interested in hearing your thoughts. Are you as impressed by Betterment as I am? Are there other robo-advisors you are considering or do you plan to continue managing your investments yourself? Anyone out there have any first-hand experience with Betterment? I know this may be a controversial move so I’ve included a lot of links in this post so that you can see all the information that went into my decision. I’m really interested in hearing what you have to say though so please let me know in the comments below. Full Disclosure: When I visited the Betterment offices, I was given a free t-shirt. Also, if you sign up to Betterment via this link (and some of the others within the post), I will earn a commission. Although I look damn good in the t-shirt and I love earning money, neither the t-shirt nor the potential commission is why I am recommending Betterment (otherwise, I would have written this article last year, before I decided to use them myself). Save money by using the losses in your taxable investment accounts to reduce your income taxes! Curious to hear your take on how Betterment compares to an investing service like Vanguard? I have heard a lot of good things about both, wondering what your take is? Thanks! Vanguard is an investment management company that provides low-cost mutual funds and ETFs to investors whereas Betterment manages a basket of ETFs for you (many of which are Vanguard ETFs). Vanguard’s funds/ETFs are the best available and Betterment is a little bit of fanciness on top to make everything easier and more efficient. which one better wealthfront, betterment or directly vanguard for baginner? Its been a few years since you posted this. 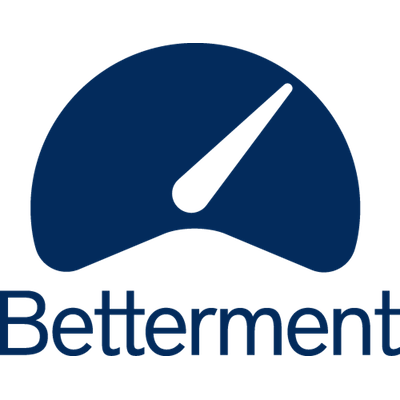 How do you like Betterment? How is your portfolio doing? Is it better than vesting in Vanguard directly? How does it compare to Wealthfromt? I am needing to sell some of my employee stock and Create a taxable account. :). Yes, I too am very interested to know…have been considering Betterment. Hi MadFientist! Do you have any update on Betterment? Are you still happy with them? I am getting close to opening a taxable account with them, but I’m still not 100% convinced. I would also like to know. They changed their fee structure and I was wondering if you still like them? Trying to decide what to do with taxable investments (401K and Roth Completed). I already have my IRA traditional and ROTH with vanguard and my 401K with Fidelity. I was wondering if Betterment would be a good option to kind of “diversify” with taxable investments? I would love an update to this article and your thoughts on Betterment today! Thanks! That’s EXACTLY why I was surprised to see the title of this article! But you make a convincing case…might have to discuss this for a few minutes at FinCon since I have to take this seriously if you are recommending it. When you transfer your funds to Betterment will you take an initial hit on your taxes for your capital gains? I was trying to figure out how that would work. Yeah, I’ll have to sell investments that have appreciated so I’ll need to pay tax on that appreciation. If I wait until after I stop working though, I should be in a low enough tax bracket for my long-term capital gains to be taxed at 0%. Honestly I had been displeased to see all the pro-betterment blog articles pop up because it seemed like people were just selling out for the money. I honestly could not see a reason to move to them. Then your article (which I almost did not read after all of those others) and you blew me away. You convinced me. Thank you! As soon as I get enough in my taxable account I’ll recheck with you and if you are still pro-betterment, I’ll be putting my money with them. However, I still have quite a bit of room in my tax advantage accounts so it may be some time. Thank you very much for the kind words, Ginger! I’m glad you can see the same benefits that I saw and have come to the same conclusion as I did. Can Betterment accept in-kind transfers of Vanguard ETFs (the same ones they use)? It seems like a) something they should trivially be able to do and b) a feature that would encourage people to move money to Betterment by making it less costly. Yes indeed, we can accept an in-kind transfer of ETFs that are in our portfolio. Our customer service team would be happy to help. That’s a conversation I’d like to sit in on. That said, if I’ve learned anything, it is that when the MF comes up with a concept it pays to listen! Thanks, Jim; that’s a very nice compliment. I’d love to hear your take on everything as well so I’m glad we’re all getting together so soon! Haha, I figured this would be a slightly surprising post. I definitely want to chat more about this so I look forward to doing it over a few beers in New Orleans! Commenting more to see what follow-up comments are made. I’m well below the threshold to take advantage of Betterment’s TLH+ (<$50K), so I'd rather go straight to the source, as it were, and stick with Vanguard or Fidelity Spartan funds. Currently I'm spending most of my free cash taking the guaranteed 6.5% return paying down my student loans. Yeah, that sounds like a good plan and is what I would likely do as well. FYI, as of last month, Betterment has made TLH+ available to all customers. The $50,000 minimum has been eliminated. Scroll down in the article to "Features Betterment and WealthFront Both Offer" and look at Tax–loss Harveting. "Tax-Loss Harvesting – Both offer no minimum deposit for this service." I thought WHAT??? I'm I reading this correctly? This is correct. They implemented TLH about 6 months ago. Ditto to Brad’s comment! I was very surprised to see this post. On the tax loss harvesting averages that Boris provided, do those numbers already account for any costs associated with harvesting (such as trading expenses, opportunity costs of being in the different but comparable investment during the wash sale period, etc.)? The reason we mere humans don’t tax loss harvest in market environments like the current one is because the benefits just aren’t great enough to justify the costs and effort; Betterment’s algorithms obviously take the effort out of the equation, but I’m curious whether these numbers reflect the costs. One other point that I think is important (especially for your audience) is that tax loss harvesting provides no benefit for people who do not have to pay taxes, a subset of the population that will include many early retirees with low incomes and/or good optimization strategies. On an unrelated note, are you still planning to be in NYC for a meet-up in the near future? This is one reason why I’m surprised MadFientist is making this move. If he’s FIRE’d soon (under a year if I’m remembering correctly), he likely won’t be seeing the benefit from Tax Loss Harvesting, since he’ll be in a lower tax bracket which pays 0% tax on capital gains. However, he won’t be able to leave Betterment, without paying capital gains on his entire taxable portfolio, so he’d probably stay. Staying in Betterment, paying the extra 0.15% fee for the rest of his life. As I described in The Power of Quitting post, I’m actually going to keep working remotely for the foreseeable future so I’d love to lower my taxes more while I’m still working. Once I stop working, I should be able to get out fairly quickly (although I don’t think I’ll want to) because I’ll be in the 0% LTCG tax bracket. Hi Eric, Betterment’s fee takes care of all trading costs so the additional trading associated with TLH doesn’t increase the amount you’d have to pay. You’re correct that people who don’t have any income to reduce or capital gains to offset will not benefit from tax-loss harvesting. Losses can be carried forward to future years though so I imagine they’d come in handy eventually. As far as overall portfolio strategy is concerned, I’m less worried about have a 70/30 stock/bond split, for example, and I’m more interested in the benefits rebalancing and smart contributions/withdrawals provide. I’m happy being primarily in equities so if I choose a 70/30 split for my Betterment portfolio, I’ll still primarily be in equities but I will be able use my contributions to do some of the smart rebalancing described in the article I linked to in the post. Good to know that trading expenses are already built in to Betterment’s fee. But I still question whether algorithmic TLH justifies all the increased trading. The average TLH numbers that Boris provided are small enough to be potentially offset by the difference in performance between the original investment and the comparable position taken to avoid a wash sale. That’s why, like others have said, it would be great to see a side by side, apples to apples comparison of a portfolio inside and outside Betterment. The alternate securities are nearly identical to the primary securities so I don’t think there’d be much difference in performance, if any. Yes, but isn’t the 0.77% overperformance as compared to a fund with no tax loss harvesting whatsoever? What I would be interested in seeing is how Betterment’s algorithmic TLH+ compares to normal human tax loss harvesting (i.e., done only during relatively big drops). The alternate securities need to be different enough to avoid wash sale treatment, so even slight discrepancies in performance could have offsetting effects against what will necessarily be slight tax loss harvests during periods of relatively low volatility. I suppose the discrepancies could cut both ways and therefore should cancel each other out on average, but it seems to me that when you account for these types of factors the benefits of algorithmic TLH are not as great as they appear at first blush. Ahh, I see what you’re saying. Yes, the comparison is against a Betterment portfolio with no tax-loss harvesting. Take a look at the list of securities here and you’ll see that in most cases, the secondary security is just a Schwab or iShares version of the primary Vanguard ETF so any discrepancies would likely be pretty small I think. Now this is a compelling reason to use Bettermint! Previous arguments haven’t swayed me, because it’s silly to pay someone 0.15% to take your money and invest it in Vanguard, when you can do that directly. Most people I’ve seen recommending it seem to just want to make money on the referrals, unfortunately. The automatic rebalancing isn’t, IMO, reason enough to switch, as, again, you could do that yourself. Algorithm’d TLH though, hmmm..
I’m really glad you think so, Joe. Since I’ve always tried to keep my fees as low as possible, I didn’t think twice about Betterment at first. The more I read about it though, the more the 0.15% fee seemed worth it. When I realized everything I wanted from Betterment could be had by just transferring the taxable portion of my portfolio there (thus reducing the fee to less than 0.15%), it almost seemed like a no-brainer. What is your experience with Betterments service/fees compared to PersonalCapital? They both offer competing services. Thanks! Personal Capital’s lowest fee is 0.89% whereas Betterment’s is 0.15%. I’m more interested in the functionality that Betterment provides anyway so it’s an easy choice for me. I’m wondering if their TLH+ method created a drag in performance by being out of certain funds (I’m assuming mostly equities/REITS) for 30 days at a time? When the market is doing well this could be cause for concern. It would be interesting to see performance of betterment account using TLH+ against a regular taxable Vanguard account with same asset allocation. obviously a two month period isn’t enough sample size to say one way or another.. but just something to consider I guess. Good thinking Charlie but as James said, they move the money into a similar security so you’re still fully invested at all times. MF-ing Mad Fientist, I hope you’re doing well :) As always, I really enjoyed reading your article. Although there are many robo advisors out there, I also think Betterment currently has the best value proposition. I have a few additional questions about the services. Do their algorithms also take into account tax gain harvesting? If you close your account at Betterment in the future, are you required to sell your existing shares? Do they always use municipal bonds in their taxable portfolios (or is it customized based on your tax rate)? How do they use their dividends in taxable accounts (i.e. automatically reinvested, send a check, use for rebalancing)? How much value is added with the tax loss harvesting tools while working vs. in retirement? I assume the benefits are greater while working for early retirees. At the end of the day, the 0.15% provides a low hurdle for the Betterment to clear with their services in a taxable account. Hey Nick, really glad to see you chiming in on this one! Hope you’ve been doing well. – I don’t believe they do any tax-gain harvesting because they don’t have a complete tax picture of their clients so it’d be hard to determine when tax-gain harvesting would be appropriate. – You aren’t required to sell your shares but I do believe there would be a fee to do an in-kind transfer to somewhere else. – It looks like they use MUB (iShares National AMT-Free Muni Bond Index ETF ) for taxable portfolios and BND (Vanguard US Total Bond Market Index ETF) for tax-advantaged portfolios. – Check out this post to read about how they handle dividends. – I would agree that tax-loss harvesting is more beneficial when working so I’ll reassess things once I finally throw in the towel for good. Let me know if you have any other thoughts on all of this because I’d love to hear them. I have to hand it to you, MadFI: you really do your research! This is why we’re so excited to have you as a customer. Just one tweak: we don’t charge a fee for an in-kind transfer, in or out. Hey Boris, thanks a lot for stopping by to clarify things! Great to see there aren’t actually any additional fees for in-kind transfers. – what is an in-kind transfer? – if I opened a Betterment account, can I invest on Vanguard’s index funds even if I don’t have a Vanguard account? – if I have Vanguard index funds managed by Betterment, does it mean I pay Vanguard their fee and Betterment their 0.15% fee? An in-kind transfer means transferring shares you already own directly from one custodian to another, rather than selling them, transferring the cash, and buying new shares. In most cases an in-kind transfer is better, since a sale is a taxable event and a transfer is not. Yes (sort of). Vanguard does not charge a fee per se. The fund pays expenses from the assets of the fund, which slightly reduce its performance. The proportion of expenses to the total assets of the fund is known as the “expense ratio.” The lower that number, the better. No. The Vanguard (or any ETF) expenses are built into the performance of the ETF and cover their operating costs, and Betterment charges their fee for providing their management and robo-advisory services. Unless you can afford Admiral-class shares though, you might be better off paying Betterment anyway. Betterment’s fees are how you pay them to cover the cost of trades, provide the auto-rebalancing services, tax loss harvesting, process deposits/withdrawals, etc. Thank you for your quick reply. It’s good to hear that you wouldn’t be required to sell your shares (and there wouldn’t be a in-kind transfer fee). Also, I’m happy to see the way they are handling the dividends. It looks like the benefits will outweigh the costs for you while you are working. Once you officially retire, the municipal bond holdings will likely not be optimal and the tax loss harvesting will not be as beneficial (especially if you plan on taking advantage of the 0% LTCG rate). As always, you have a great game plan. A couple more questions: Do you manage your portfolio on an account-by-account basis or on a household level? Also, what is your stance on asset location? Thanks! Glad to hear you think so, Nick. I manage our portfolio on a household level and I think asset location is important but I’m willing to sacrifice optimal asset location for the other benefits mentioned in the post. Agree? Yeah I agree, the construction of their 70/30 taxable portfolio is already fairly tax efficient anyways (with passive ETFs and no allocation to REITs, HY bonds, commodities, etc.) so probably isn’t going to hurt your asset location strategy too much. As always, thanks for sharing! Have you sat down and computed what Betterment’s lack of Tax Gain Harvesting is costing you in your taxable accounts to determine that that “cost” plus their 0.15% fee is still less than the benefits gained from their superior Tax Loss Harvesting algorithm? I’d have figured that someone like you mathematically inclined to run the numbers each year in FI would come out ahead doing your own TLH and TGH versus using a service like Betterment. Another somewhat contradictory-sounding question: how beneficial are TLH and TGH to FIRE-types that don’t have additional income in early retirement? Since capital gains are effectively tax-free under current tax laws if one stays in or below the 15% tax bracket, what gains are there that need to be offset with tax losses, and what value is there to stepping up gains? Will Betterment manage FATCA & FBAR for you while in Scotland? Betterment is based in the US so FATCA and FBAR won’t apply. I’d love to see a Guinea pig scenario based on your portfolio over the last year/current year with Betterment. Do you think Boris could put that together to see how the algorithm would have acted? Curious to see the actual results versus the averages over the general population. That’s a great idea and something I actually approached Betterment about when I started the GP experiment. I thought it would be interesting to get a demo account and do what you proposed but they sadly didn’t have the capability at the time. I opened a Betterment account last January to see how my money would perform. Thus far I have only seen a 2% return. Not sure if it is my allocation of 90% stock 10% bonds but it was less than I had hoped it would be. Is the Behavior Economist telling me something? I understand your rational but am curious if i am doing it wrong? I like the idea of using betterment for to simplify my life but how do I make it work better? Thanks! What have you been doing since you opened the account? I have just been watching to see what it would do in comparison to Vanguard and some other Funds that I hold. I am trying to decide where to invest my funds and am swayed by your reasons but am unsure based on the numbers so far. Thoughts? Thanks. See my post above for my thoughts, haha. I think that having your tax-advantaged money in Vanguard funds and your taxable money with Betterment seems like the best of both worlds. This is kind of interesting I’ll admit, but it just doesn’t really work for me, at least not pre-FIRE. The problem is, Betterment is a complete solution. However, as an employee with a 401(k), I don’t need a complete solution. I can’t put my 401(k) in Betterment! And I’m far better off tax-wise putting my more heavily taxed assets (such as my bond funds and my international stock funds) in my 401(k) and my domestic stocks in my taxable. But Betterment doesn’t let you buy a specific asset class – you can only buy stocks and/or bonds. So, already having international stocks and domestic bonds in my 401(k) for tax efficiency, all I need to complete my portfolio is domestic stocks. But since I can’t choose just domestic stocks at Betterment, I would be poorly diversified with a 100% stock allocation. My 401(k) doesn’t offer a good low-cost domestic stock index like VTSAX (only international and domestic bond) or I could hold 2 fully balanced portfolios. Add the fact the Betterment bond funds in a taxable account will be fully taxed, and I’m in for some trouble. I don’t know how much Betterment will give you with tax-loss harvesting, but it can’t be more than I’ll lose by adjusting my allocation across my tax-deferred vs taxable accounts and paying more in taxes. Will have to wait and see once they release more data. I too look forward to seeing more data about TLH+ so I’ll be sure to update this post when the first performance report is published. Got an update for us? What about the fact that TLH “increases” your cost basis when you eventually sell? That is an interesting angle. Check out Michael Kitces 2014 blog on the subject. When I finally sell, I will no longer be working full time so I should be in the 15% tax bracket, which will mean my long-term capital gains will be taxed at 0%. 2 – It’s also not just Betterment… as a comparison, I also put an equal amount of money into Wealthfront as a comparison, and which has a similar value prop, and gains there are essentially 0% over 4 months…. So my question is…. Why invest based on cost minimization rather than gains maximization (given a level of risk) when investing in low cost index funds yourself will net you higher returns? *** note – I also don’t have TLH because of the amounts invested… Is this really going to offset normal gains though vs other alternatives? Betterment and Wealthfront is lazy way to invest, but is it really the best vs index investing or dividend investing strategies you do yourself? If I was worried about cost minimization, I would just keep my money invested in Vanguard’s Total Stock Market Index fund but I think the benefits of going with Betterment should more than cover the additional costs so that’s why I plan to transfer my taxable funds there. Three months really isn’t enough time to form any definitive conclusions about anything but the fact that you are ready to switch things up after only three months makes me think doing things yourself is probably a bad idea. If you have the tendency to hop in and out things, you will incur additional costs and trading fees out on your own, which will likely result in a large behavior gap and lower total returns. Exactly. I really enjoy researching different strategies and developing a sound financial plan but I could care less about the actual execution of the plan. In fact, whenever I get involved in the execution of the plan, my brain seems to sabotage things and I deviate from the plan (see Cognitive Bias post). Betterment will allow me to just set up an automated withdrawal from my checking account and they will handle all the asset allocation, tax-loss harvesting, rebalancing, etc. and I won’t have to even think about it and I’ll have no opportunity to sabotage things. TLH sounds great and everybody that pays taxes would be smart to do it. A TLH algorithm for handling this makes investing much easier, so more and more inviduals and companies should utilize a TLH algorithm. TLH algorithm utilization could make mini-crashes more likely…similar to the 2010 flash crash. You don’t have to worry about TLH algorithms causing any sort of problems because I’m sure the money affected by TLH algorithms is a small drop in the bucket compared to the amount of money managed by much crazier and scarier algorithms created by those on Wall Street. While reading the white papers and other information about Betterment, I realized that this probably had some caveat to the data that I wasn’t seeing. I just did a quick search to see what others have said about this and I think I found that caveat. Their TLH backtesting are based on probably (one of) the best time(s) in market history to perform TLH. With two major market collapses, they are optimizing the test period for optimal results. If they had gone back 30 years, I’d bet that they see relatively little opportunity for TLH, which would have diminished their numbers. I can sincerely tell you that we would have loved to go further back, and tried, but we didn’t have the data. Some of the ETFs we use are 2 years old, and had reliable proxies of *daily* returns back to 2000, but no further. It’s possible that a longer stretch will drift the benefit downward, and we always try to revisit our assumptions when appropriate and feasible. You’d be surprised however, how seemingly minor volatility, coupled with regular deposits (say once or twice a month) creates harvesting opportunities. With auto-deposit (which the majority of our customers use) you are often hitting local maxima, allowing us to sell when the asset class reverts. The results I gave to MadFI, in the post above, are largely due to the dip in August. Some turbulence, sure, but not exactly 2008. So long story short: we’d never suggest that the last 13 years, or the last 2 months, are “typical”. But it’s all we have for now, as far as backtested and empirical data goes, respectively. None of us can predict the future – we’re just working hard to build cool (we think!) super-efficient stuff that we’d want to use ourselves. Thanks for your response. I think what you guys are doing is cool. I’m just skeptical, in general, about things like this. There always seems to be some sort of catch or the data is cherry-picked, so I’m accustomed to looking for that. I will say that it would quell my suspicions if you could put something together for the previous 13 years, even if it were purely speculative with different funds that what you use now. I guess I’ll just have to wait for the Mad Fientist update, though. There wasn’t a major market collapse June through August this year and yet TLH+ was able to harvest a significant amount of losses during that time, as the data included in the post shows. That’s actually what’s so exciting about it (i.e. harvesting losses when volatility is relatively low). Anyone can easily harvest losses after the 2008 crash but only a sophisticated algorithm could harvest that many losses during a period when the markets really haven’t done much. Yeah, I plan to open my account before I head overseas and since the move is only temporary, it shouldn’t be an issue. I’ll also continue being paid into my American checking account and will set up automated contributions from my US checking account so although I’ll be living outside of the country, my financial life will still be taking place as though I was still living here. I’ve looked into Betterment a number of times, and continue to consider it. You’re article and the linked white paper are certainly swaying me again. My problem, as it’s been for awhile now, is I still don’t see Betterment or any other similar tool having a good “dividend income” option. Now that I’ve retired, it’s preferable to me to have a certain target monthly (or quarterly) dividend payment that is unlikely to be unexpectedly cut. This is why I’m still stuck investing in individual stocks in the “Dividend Champions” list, and analyzing each. Have you seen any support for a model like this with Betterment or other tools? I haven’t. As it happens, we’ve had so much interest from our customers for something like this, that we built it. The dynamic income product takes in your individual preferences, and lets you set auto-withdrawals that drop income into your bank account, like a direct deposit salary. The algorithms are constantly assessing what is a “safe” amount to withdraw, readjusting as necessary based on your portfolio’s performance. This allows us to virtually guarantee that your money won’t run out over the time period you specify. Check it out, we’d love to know what you think. Customer feedback built this product, and will surely continue to shape it. One other thing… TLH is nice, but I’ve seen a lot of mistakes made from prioritizing TLH also, and having an algorithm to do it could be dangerous. I’ve spent the last 2 days working on a plan to re-allocate my portfolio, which I haven’t done since January of 2013. The problem is, all the stocks I want to sell are way up – and all the stocks I want to buy more of are way down. This isn’t surprising, since the idea is to buy low and sell high, but TLH tends to want counter this by selling some stocks that are down. This is great for taxes, but it only makes sense if you actually believe the stocks are over-valued. Otherwise you’re avoiding a 15% tax on gains, but compromising a potential larger return. Of course, all this assumes that you believe in a somewhat inefficient market. If it was truly efficient, which I don’t believe but many do, then you’d be well off to always follow the TLH approach. Yeah, it will definitely make things harder when I eventually want to exit my positions but I prefer to increase the amount I can invest now as much as possible and then I’ll just have to figure out how to lower my costs/taxes/etc. when the time comes to get my money out. By the way, would you be interested in being interviewed for an episode of the Financial Independence Podcast? Not only do I want to hear how you achieved FI but since my transition to early retirement is looking eerily similar to yours, I’d love to chat with you about it. The Tax Loss Harvesting part of Betterment sounds pretty great, but I’m confused why you’d want to do that when you are retiring and won’t have nearly as much of a tax burden? I’m considering Betterment now, because I’d easily be able to use those paper losses. But when I’m retired I plan to be paying pretty much 0 in taxes every year anyway. Any insight why that tax strategy works well for you in retirement? Exactly. If you defer taxes in your 401(k), and pay basically no taxes on having total stock market index funds in your taxable, and then FIRE and pay no taxes, I’m not sure how this helps. I get the idea this article is for very-high income people who are having a “spendier” FIRE. As I mentioned in The Power of Quitting post, I’m going to keep working for the foreseeable future so tax-loss harvesting should be beneficial for a while at least. Even after I leave my full-time job, I expect I’ll still earn some money so having losses to play with should be useful. Also, when I do start withdrawing from my accounts, I like the idea of setting up an automated withdrawal and letting Betterment figure out which shares to sell (see this article for more info). I really don’t know why you would want to do this? Couldn’t you do your tax harvesting through Vanguard? And wouldn’t it be cheaper fee wise. Also at Vanguard you are not just a client you are are shareholder of the company. Vanguard exists for its shareholders, unlike Betterment. Someone else commented that Betterment does not accept investments from overseas, whereas Vanguard has offices in London. Seems a steep price to pay for a tee shirt. As I described in the post, I haven’t harvest any losses and it’s not for lack of trying. An algorithm can do things I can’t and the benefits of using the algorithm exceed the costs of using the algorithm, in my opinion. My Vanguard tax-advantaged accounts will stay at Vanguard so I’ll remain a “shareholder” of the company. The fact that Vanguard has offices in London is irrelevant to me because I will keep earning US dollars when I’m living over in Scotland and I won’t be earning any pounds, since I’ll be working remotely for an American university. I guess I was looking at this from my own situation. I am already retired and in a low tax bracket. I see now that this can really benefit someone in the accumulation stage of early retirement as long as Betterments fees remain low. Good luck with it. I look forward to seeing how well it will work. Thanks, Tim. I’ll be sure to keep everyone posted on how it’s going once I make the move over. Oh Snap, somebody hacked MF’s blog and recommended Betterment! I actually came to this same exact conclusion about one month ago. I’m in the process of moving my money in taxable accounts to Betterment, so that I can eventually take advantage of the tax loss harvesting. I still have a large amount in Vanguard through retirement accounts, however. My biggest concern is how to keep the funds in my Vanguard retirement accounts from being the same and resulting in wash sales. Are you truly planning to avoid owning any similar funds in your retirement accounts? I will still own similar funds but I will make sure that they are different enough to avoid wash sales. Luckily, Betterment goes with the “value” version of many ETFs whereas I just hold the normal versions (i.e. not value or growth). I’ll have some juggling to do but since most of it will happen in my tax-advantaged accounts, it shouldn’t be that big of a deal. Does this mean your ERs in the tax advantaged accounts will increase? If so, how much will that eat into your gains? Since ER is percentage based, and tax loss harvesting has a yearly max of $3,000, I can see this getting away from you very quickly. If TLH is capped at 3k and an expense ratio of 0.15% is added on top, one would need 2MM for the latter to surpass the former, assuming you have that much TLH. I think the MF will have far less than that, especially given how much of a proponent he is of tax-advantaged accounts, and that he’s only going to use BM for taxable. Joe, you are treating the $3,000 tax deduction as if it were a tax credit. With a marginal tax rate of 28%, one would only need a portfolio greater than $560K for the latter to surpass the former. Rob’s original point about the $3K max is mitigated by the fact that that cap only applies to ordinary income, but that still doesn’t help much because the MF (and others in his situation) likely won’t be earning much in the way of capital gains until after the accumulation phase when his earnings will be low enough for him not to owe taxes anyway (and the tax losses won’t do any good). Good point Eric. Thanks for the correction. Also remember guys that losses can be carried forward indefinitely so even though a single year has a $3,000 cap, the additional losses can be utilized in future years. No, my ERs will stay the same because a lot of my retirement funds are with Fidelity (my current employer’s preferred custodian) and the stuff I have with Vanguard is already different than the ETFs Betterment uses so I won’t have to make many changes. While tax-loss harvesting can only reduce your taxable income by $3,000 in a single year, any additional losses can be carried forward indefinitely. Right, but for someone who can only take advantage of $3k per year, on a relatively large portfolio the incremental 0.15% fee quickly eclipses the savings. And there would be no savings in the first place to the extent opportunities arise for manual tax loss harvesting (if we have a significant market correction, with a sizable portfolio one could easily tax loss harvest an amount large enough to fill the annual $3k bucket for many years into the future — possibly enough to carry one through to FIRE when the tax losses are no longer useful). If optimization is truly the driving factor, have you considered moving only a portion of your taxable portfolio into Betterment? 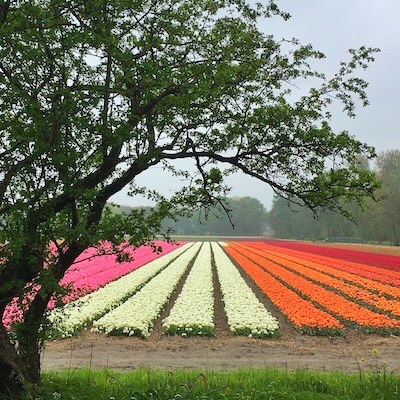 From the numbers Boris provided, it looks like their algorithmic TLH might be able to achieve significant harvests even with a relatively small portfolio. But that would create the additional headache of needing to manage your separate taxable accounts in light of what’s happening inside Betterment. Alternatively, someone who has no use for excessive tax losses could move a large amount into Betterment, and then bail out as soon as TLH+ has harvested sufficient losses to last indefinitely into the foreseeable future. Ahh, I see what you’re saying now, Eric. Since I plan to only move the proceeds from my house sale and some other cash I have laying around at first, my balances will be low enough so that the fee doesn’t outweigh the benefits of TLH. If I feel I am getting all the benefits I can with only that amount of money in there, I may leave it at that and not bother trying to efficiently move my other taxable funds over. That would definitely make things a lot easier so hopefully that will be the case. I’m a little confused about this discussion of wash sales as they pertain to taxable vs tax-advantaged accounts. I think I have a decent understanding of the wash sale rules, but could you give an example of how a sale of a fund in a taxable account could trigger the wash sale rule for something you did in your tax-advantaged account (or vice versa)? Let me provide my own example just to see if I understand this fully… Let’s say I withdraw $6000 from my Betterment account, which of triggers a sale of several ETF’s held there. Let’s also assume a large chunk of that was from VTI, and it was sold at a loss. Now, let’s say I deposit $5500 of that into my ROTH IRA and purchase VTI there within 30 days. Are you saying that would be a wash sale and I could not claim the loss from selling VTI in my Betterment account? Now, what if instead of purchasing VTI in my ROTH, I purchased SCHB instead (Schwab Broad Market ETF)? VTI and SCHB are very similar ETF’s and invest in almost the same exact underlying stocks. Does that trigger a wash sale as well since the two funds are “substantially similar”? Just trying to better understand this, because until I read this blog post, I never realized the wash sale rules could be triggered by transactions in a tax-advantaged account. Thank you Boris! I appreciate you jumping in here to answer my question. Since my IRA isn’t at Betterment, I guess I just need to be aware of this if I ever cash out funds from my Betterment account and invest the money into the same fund(s) in my IRA. All our investments in tax-advantaged accounts (403, 459, 457 and 401k) are in ITOT (total stock market ETF), VTSAX and Vanguard SP500 index fund. Could Betterment only do TLH+ on funds other than VTI to avoid wash sales from the monthly trading that occurs in my other tax-advantaged accounts? Otherwise any TLH made on VTI inside the Betterment account will trigger wash sales from our monthly buying of shares of ITOT and VTSAX. I’m both surprised and happy to hear about this move. I’ve been moving taxed funds from the UK to the US with betterment over the last 4months, and almost qualify to their TLH, and I hope to see a return on those. I think that the numbers game that Betterment offers, as long as they keep true to their values and offers, can give much more than self diversifying through Vanguard and such on taxed investments, and the power of the dollar allows some great and constant entries to the market. Thank you for posting, and mainly confirming to me that I made the right decision if the MF himself is joining in. Glad you enjoyed the post, Gilad, and happy to hear you’ve been happy with Betterment so far. I would stay with Vanguard. If your fees go up to .5%, that would likely replace any tax harvesting dollars you could save. Plus the market timing of tax harvesting just seems like another active management strategy to get you to trade more. I read about people switching from Betterment. There will be added pressure to buy things that you probably don’t want. If the fees were increased to 0.5%, I’d just do an in-kind transfer to get my money out of there. Pressure to buy what other things? I’m curious as to why you chose Betterment over Personal Capital? I’ve looked at both with a bit of interest, but haven’t pulled the trigger. There are some things I like more about each, but each has a legitimate approach to improve the risk/reward ratio for individual portfolio’s. I’ve personally been leaning a little more towards Personal Capital. Personal Capital’s fee of 0.89% is just far too high for me and I actually think Betterment provides a better service anyway. So, will bettermont provide all of this information an easy to use fashion for your taxes? Yes, since they manage the entire stack and built everything from the ground up, I’ve heard they provide some of the best documents in the business. Can you answer a few questions that go unanswered from the white paper? Maybe you need to reach out to Betterment themselves or maybe you know the answers already. What is the threshold they are citing for the minimum value to sell as a harvest event? One guess might be the 30 day volatility of a stock since that is the wash sale minimum, but perhaps their Monte Carlo simulation proved otherwise. And what is the equation they are going through to evaluate when a harvest event is beneficial? The way I figure, you need the deferral horizon (cited as 67 when not explicitly set), the new and old cost of the ETF (commission and spread included). The amount. The long term capital gains rate. And finally, the **expected return** of the stock. Which begets more questions like which formula for expected return are they using? What do they consider the risk free rate of return? The white paper leaves a lot to be desired and to be honest reads more like a marketing blog post than a clear explanation of a complex problem. I’m hoping you can shed some light on these areas for myself, us Fienests, and yourself too since your money is there now and you should know what it’s up to. Hi Ellis, I don’t have any inside knowledge regarding the actual harvesting algorithm itself so I’ll see if Boris can chime in again to provide some additional details. How cool that you met his first at FinCon last year. I so wish I was going this year! It seems like a great way to meet and connect with people. Thanks for sharing your decision with us and explaining why. It certainly seems like something worth looking into for my own personal financial situation too. It is a great way to meet and connect with interesting people so you should definitely try to go next year! The technology sounds great, but if you go to the performance tab in the demo account and compare SPY vs. Betterment’s 100% stock allocation since inception (2008 or so), SPY has returned 57.7% while Betterment has returned 33.1%. It looks like their diversification strategy didn’t work so well over the last six years. Can they justify why they think it will match or outperform the S&P 500 in the future? I’ve looked all over their site but can’t find anything that explains their reasoning. Can you point me to where you are getting those numbers? Using Betterment’s tool on their front page to track their performance and Google Finance to track the performance of SPY, I see a strongly correlated results, which is what I’d expect to see due to them likely pouring money into their corresponding ETF. Maybe you saw SPY was up 57.7 points since 2008, which is approximately 33%? In either case, the diversification strategy is to keep people who are pulling money out of their funds from selling at the bottom of the market. If you are diversified and part of the market crashes, you are going to pour money into that part of the market no matter what. So, the best way to test their strategy is to see how someone pulling $X out each month fairs against someone solely invested in the S&P 500. I would venture a guess that they are way ahead at this point. For people who are reading this in the future, SPY appreciated $56.67, which is 40.81% from January 11, 2008 to September 15, 2014. Comparing the “Betterment 70% stock” from January 2008 to end of April 2014, SPY still beats betterment (47.52% vs 40.2%). “Betterment 100% stock” performed even worse, with a 33.5% return. None of Betterment’s 11 various stock allocations beat SPY for that period. When comparing to S&P 500 (which Betterment appears to do), be advised that the standard index does not include dividends, making it basically invalid for comparison to a portfolio. To include dividends, use the S&P 500 Total Return index, aka. ^SPXTR. This is completely irrelevant. Betterment’s allocation includes international equity and small-cap US equity, neither of which is tracked by S&P500. A better comparison for Betterment would be VT, a total-world equity fund. It, too, has underperformed S&P500 over that period. Whoah, I learned a bunch today. For some reason, I thought that the fees with Betterment were higher, so I never looked into it much. .15 is very reasonable, even on top of the Vanguard fees. Others have already pointed out that this TLH is great if you’re working, but doesn’t provide much if you’re retired. So, I know you continue to work (congratulations on the un-retirement by the way), but the majority of the rest of your life will probably be spent not working. So, I’m curious to see what you do with your Betterment account post retirement. Will you leave the money in there and draw it down for living expenses or will you transfer it somewhere else altogether to avoid the Betterment fees? Thanks again for the thoughtful and well researched post. PS: As a software developer, I’m jealous of Boris and the code he gets to write! PSS: In another comment, you alluded to the crazy algorithms that the fast computer traders write. Have you ever read about that stuff? Mind blowing. I completely agree that Betterment won’t be as useful post retirement, so I plan to reassess everything when that time comes, but it may still be worth keeping for their smart retirement income algorithm. I like the idea of just getting a regular paycheck from my accounts and knowing that the right investments were sold without me doing anything. P.S. I too am jealous of the cool code those people over at Betterment get to write. If they were a Ruby on Rails shop, I’d probably send my résumé over to see if I could join in on the fun. P.P.S. I haven’t read much about high-frequency trading algorithms but I imagine it’s pretty mind blowing (and probably a bit scary). I’m not sure what funds are in your taxable portfolio, but I’m assuming you hold a variety of equity index funds for tax efficiency purposes. It’s hard to imagine the MF trying to pick individual stocks…Did you deliberately choose a variety of different funds specifically to take advantage of gain/loss harvesting instead of just keeping it all simple with VTSAX? Maybe I missed it but have you ever shared the funds that you hold in a prior post? I completely agree with Jim’s simply path and holding only VTSAX is a great strategy for someone in the accumulation phase. I haven’t shared the funds that I hold but maybe I will in a future post. A lot of my money is in Fidelity’s version of VTSAX (FSTVX) because that’s my current employer’s custodian. Since FSTVX is one of my biggest holdings, I utilize some of Vanguard’s other index funds elsewhere. When I make the move to Betterment with my taxable accounts, I’ll likely use that as an opportunity to simplify things and consolidate everything a bit more. For retirees’ portfolios that are, for the most part, in qualified accounts (IRAs – both Roth and Traditional, SIMPLEs, and annuities) is there a “Distribution and Estate-planning component” in the works that expands on the Tax Harvesting and Asset Allocation & Rebalancing algorithms currently in use? Assuming “Acquisition” activities are successful, this is the next area that needs the most planning particularly from a tax perspective. Yes, Betterment has a retirement income feature that utilizes their TaxMin method to intelligently sell investments. Great conversation! I’m not at the point right now that I need this since I plan on using any money after maxing my tax advantaged accounts for downs on real estate to increase my passive income but I’m definitely interested in a lab rat apples to apples comparison down the road! Looks like I’m going to be the lab rat in this scenario so I’ll be sure to keep you posted on how it goes! Man I’m lovin all these financial independence blogs. By the way I just read your article on Business Insider, those comments had me cracking up. So much jealousy in one comment section. I hear the same thing in the real world, what with my economics professor sayings things like “you guys will be working long after 65” yadda yadda. Keep it up man I hope to live a similar life to yours. Yeah, any time one of my articles hits mainstream media, those are the type of comments I’ve come to expect. Pretty entertaining! Hey man I read the article and comments on Buisness Insider. Don’t let the comments get you down, they sound so jealous. I’m 60 and I wish I was smart enough to do what you’re doing when I was in my 30s. I was able to retire @ 58 and that was great for me. People criticize for lots of reasons, but mostly they are either jealous or unwilling to try something different! If these type of blogs had been around when I was 20 I would have retired @ 30 also. Keep up the good work, you’re on the right track! They definitely sound jealous. Most of the comments were very obviously projecting onto him the reasons they believe they can’t afford to do what he is doing. I bet if half of them sat down and reevaluated their “needs” they’d figure out they’d be able to retire early too. Reevaluating “needs” and updating spending accordingly can shave many years off of a career but nobody seems to do it. Instead, most people just keep buying things that don’t make them happy and then they spend their free time leaving ridiculous comments on Business Insider articles. People are weird. Thanks, Tim. They actually don’t bother me but they do make me appreciate the intelligent and kind commenters around here so thanks for taking the time to leave me a message and congratulations on your early retirement! Actually, I was surprised at how many positive comments to it there were. Although the negative ones still held the majority. I especially liked the one from Ed Mills. Get that man for a guest post! I’d love to hear a MFMF Podcast Interviewing Ed! Ed Mills is a great guy that I’ve had the pleasure of chatting with quite a bit via comments here and emails. I love that comment he left on that BI article and it was very nice to see after reading so many terrible ones! Good idea about getting Ed on the podcast, Joe. I added him to my list of future guests so hopefully I’ll get him on the show soon! He is a new voice to me and I’m delighted to hear he has a blog. Thanks for the specific post recommendations. Looking forward to your interview with him, MF! I’d also love you to interview Arebelspy. His comments on the MMM forum are always on spot and insightful. It would be fun hearing more from him. I do have a face for radio… just maybe not the voice. Great call, Jim! Joe has been added to my list too. I plan to ramp up my podcasting frequency so all these excellent suggestions are much appreciated! This post was very well researched and written MF. I’m a big Betterment fan as well and am considering the switch with my taxable Vanguard investments. I’m interested to see what you do in the coming years with your investments parked in Betterment if/when you decide to stop working. I imagine Betterment will continue to be a fantastic company that will provide incentive for you to continue using their products. Thanks a lot, Kyle. I’ll have to reassess once I stop working but I like the idea of Betterment’s algorithms doing all the tax-efficient selling for me when I start making withdrawals so I may stick with them even after I stop working full time. 1) Their fees are likely to increase in the future. They are still in the growth phase and hence underpricing their services to gain traction. They know that once people move their taxable accounts to them that it will be costly to transfer them out. Even if they don’t have any intention of increasing their fees, a potential company acquiring them might feel differently. It is uncertain whether their business model will be successful; especially at the current rates and looking what the competitors are charging. 2) Two months of data is not enough to draw any kind of conclusion or extrapolate the data. How many accounts already had an unrealized loss when the feature was introduced? 3) There is a limited amount of tax loss harvesting possible. Since the markets go up in the long-run, at some point one has to take a long-term gain in order to make room for another round of tax loss harvesting. Since long-term gains take 12 months to materialize, and you don’t want to actualize any losses during that tax year the gain is realized, you won’t get any opportunity to tax loss harvest somewhere between 12 and 23.9 months. During that time you are still paying their fees, but won’t get the tax loss harvest benefit. 4) Why not set up automatic alerts and do any gain/loss harvesting yourself. Anybody who does gain/loss harvesting will have very few lots. Hence, any calculations to come up with the price where harvesting makes sense are very quick. It works great for me. 1) Yes, this is a possibility but since there is no fee to do an in-kind transfer, I could just transfer the ETFs to another brokerage if the fees increased. 2) Good point. I look forward to having more data as time goes on but their initial figures seem promising. 3) Since I’ll likely leave full-time employment over the next fee years, I’m just trying to squeeze out a bit more losses before I call it quits and then plan to reassess after FI. 4) My problem is, I hesitate to pull the trigger on things when I do it manually. I want to automate as much as possible so that my Cognitive Biases don’t sabotage my plan. (I know you went with betterment rather than wealthfront.) The figure at the bottom of that article is particularly interesting. I agree with Kitces’ analysis and luckily Betterment didn’t make the same mistakes Wealthfront did in their white paper (see Kitces’ take here). For future early retirees, the benefits of TLH are far greater than they are for the average work-until-you-die consumer because lowering your cost basis is not as big of a deal if you have a 0% long-term capital gains tax rate when you eventually sell the shares. That’s why TLH is such a powerful tool for people like us because we can lower our taxes now (when they are high) and then as long as we do some planning when we sell after finishing work, we may not have to pay any tax on the increased gains when that time comes. Thanks for your quick reply, MadF, and for the link to the white paper. By keeping my money at Vanguard, I’ll pay lower fees than you, and will end up with more money. You’ll be investing in a for-profit startup that may or may not be around in a couple of years, while I’ll know my life savings is safe at an investor owned company. I spend about 10 minutes per year tax loss harvesting (which is really only beneficial to the top 2-3% of savers), and have enough carryforwards from 2008-09 to last another decade. TLH is by no means a free lunch beyond the $3K income deduction anyway, since it lowers cost basis. As many experts have pointed out, the TLH benefits Betterment and others claim are greatly exaggerated. For one thing, they only compare to someone never TLHing on their own, not to my 10 minutes per year TLH method. How much have you harvested this year, Steve? It’s not investing in a for-profit startup because you own all the ETFs and can do an in-kind transfer to another brokerage at any time you want, for free. I’m not as impressed by Bettermint. 0.15% fee is still a lot of money on a $1M portfolio, equal to $1500 annually. And that will only increase as the size of your portfolio goes up. Think of paying $15,000 a year on fees when you got a $10M portfolio. No thanks. TLH is overrated. You end up with a lower cost basis, which means a higher tax bill when you eventually sell. Or perhaps you will never sell. Then there are only a fixed number of equivalent securities that are interchangeable with each other for TLH, and after a few moves, your options would be exhausted. If you only sell after leaving your full-time job, you likely won’t have to pay any tax at all so that’s why tax-loss harvesting is so valuable for future early retirees (see my post on tax-loss harvesting here). The fees are still too high regardless. Also, you can only get a maximum of $3000 tax loss against ordinary income a year. For a $400-500k portfolio, for example, if Betterment can TLH $2609 in 2 mo, that is $15654 per year, which means $12654 can’t be used within the same year and have to be deferred. Use Betterment for 10 years, and you are looking at $126540 cumulative tax losses that haven’t been used. Say you then retires after 10 years and harvest no more losses, it would take you over 52 years taking $3000 per year just to clear all $126540 tax losses out. Given the time value of money, that is simply not worth it. My plan was just to use the proceeds from my still unsold house to open a taxable account at Betterment. The house proceeds combined with some cash I have sitting around would likely only just exceed $100k or so, which would provide ample (but not excessive) tax-loss harvesting opportunities while minimizing my costs. Sorry if I am confused – but can’t your capital losses also be deducted against your capital gains? I don’t understand why everybody is focused solely on the $3,000 per year you can deduct from your income. Wouldn’t having a pile of carried forward losses be helpful one day when you do actually need to sell your holdings that are long-term capital gains? I get it that maybe you’ll manage to hold until you have no income and hence no tax on l-t gains… but wouldn’t it also be possible the average person would tend to liquididate a lot of their holdings when they buy a house etc during their lifetime? or dare I say get divorced? And then all that tax saving could be recognized immediately at the time of the sale? Am I missing something? Hi John, yes capital losses can be deducted against capital gains but most of us expect to realize our gains after quitting our full-time jobs and will therefore likely be taxed 0% on long-term capital gains anyway. That’s why I personally get more value out of using the losses to reduce my taxable income during my high-earning years. Thought you might be interested to hear that Charles Schwab is unveiling a service similar to Betterment and Wealthfront, starting 2015. It will offer the same advantages of automatic rebalancing and tax loss harvesting (on accounts over $50k), for free. About time! Once you got the algorithm in place, there is minimum cost to do this, certainly not enough to justify the high fees that Betterment and Wealthfront are charging. Being free, Schwab will most likely take away most of the market from Betterment and Wealthfront. There is no moat in this market. I can see other brokers like Fidelity, TD Ameritrade, and Merrill start catching on and offering free robot investing with TLH soon. Wow, that is an interesting development. Hopefully they put out some detailed white papers, like Betterment has, so that I can dive deeper into their algorithms. 1) Could you explain if Betterments TLH could help if I’m trying to covert my large Iras into Roth,I have no income. I estimate with the deductions I could roll over around $30,000 a year with zero tax, but would like to convert more a year, would TLH help me convert more Iras with zero tax. the Conversions. How would you do both. I was hoping that “Free” really meant free, but as they say their is no such thing as a free lunch. Schwab invests you in their EFTs, some of which have pretty high ERs. Their “Aggressive 11” OER average is 0.26% . I compare that to my 100% Betterment Stock allocation ETF OER of 0.09%, gets you a total of 0.24% when you include Betterment’s 0.15% fee. I’m sure this should be abundantly obvious, but can someone please explain to me why betterment is of no value for non-taxable accounts? I believe the reason has to do with their fees. For retirement accounts the fees charged by Vanguard are lower, than Betterment. However in a taxable account a tax loss harvesting plan even with higher fees can be worthwhile depending on your individual situation. Judging from some of the comments above their maybe other players entering this area very soon and they may offer lower or even free TLH services. If Betterment didn’t charge the .15% fee, would you use them for your “tax-advantaged” investments too? Could you please answer the following question? I am 25 year old, still in college and graduating this year but currently unemployed. 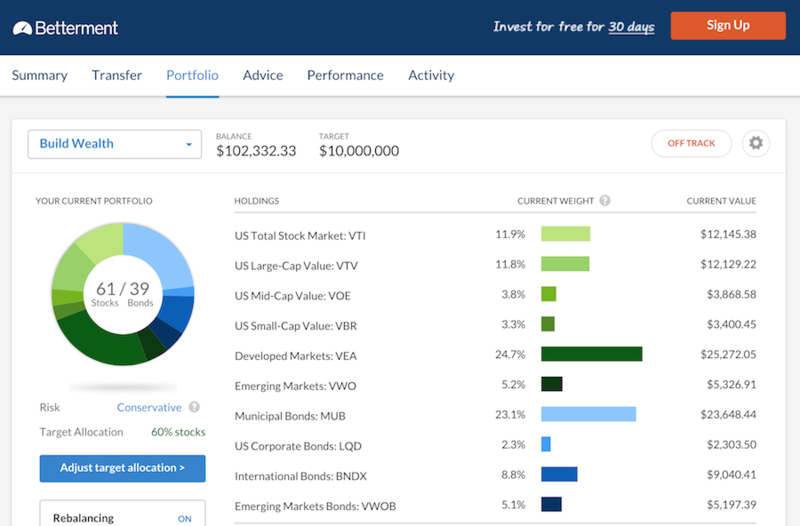 I have $10,000 in Vanguard’s VTSAX brokerage account that I invested in 2 months ago. If i sell this fund in order to move it to Betterment, will i have to pay taxes on short term gains? I am still unclear on this procedure. Could I simply withdraw my original $10,000 principle and move it to Betterment? I really like your articles esp the one about Tax-Gain Harvesting. I am wondering if I use betterment or wealthfront to invest my funds. Do you think it is still a good idea to do Tax-Gain Harvesting manually every year(once it becomes long term capital gains)? I’m considering moving my taxable funds into Betterment to take advantage of TLH+. I don’t want to move my tax-protected accounts, however. The confusing part is that my (and my spouse’s) tax-protected accounts hold some of the same funds that Betterment holds (e.g. VTI). I would have to transfer these funds to another fund that isn’t “substantially identical” to avoid wash sales. This is trickier than expected, because I can’t just move it to, say, Vanguard LifeStrategy or Target Retirement, since those just hold the same index funds. For example, LifeStrategy Growth holds VTSMX, which is the mutual fund equivalent of VTI. Mad Fientist says that his non-taxables hold differing funds that Betterment. Anyone have any suggestions on what funds I can hold in my non-taxable (IRAs in Vanguard, and my company’s 401k [though those I will have to manually figure out since they are not Vanguard funds])? In your situation, target date funds (like LifeStrategy) are exactly what we suggest. Here’s the reason why the wash sale rule is extremely unlikely to apply: the “substantially identical” test is applied to the security being bought and sold, not to whatever is being held inside the fund structure. So just like an S&P 500 fund isn’t “substantially identical” to Apple stock, neither is a Vanguard LifeStrategy fund “substantially identical” to VTI, just because it holds, among other things, VTSMX. When you purchase a blended (stocks and bonds) fund within 30 days of selling a stocks-only fund, you haven’t purchased a “substantially identical” replacement security. Now, these rules, admittedly, are showing their age in the era of index funds. My guess is, we’ll eventually get some clarity from the IRS. But until then, this is the way I personally approach my TLH: by buying target date funds in my 401(k). Of course, this is not tax advice. Thank you for that link. The lack of clarity from the IRS is confusing. For example, pretend there is a LifeStrategy fund that holds 100% VTI. Or 99% VTI and 1% of some bond index. According to the Betterment article, such a fund would be “extremely unlikely” to be “substantially identical” to the VTI ETF. Yep, under those facts, we’d more likely have a problem. If the TDF is solely a wrapper for another security, it’s be much harder to argue that the fund isn’t substantially identical (and yet there is a Supreme Court case from the 30’s that does arrive there – holding company stock ruled not substantially identical to stock of sole asset – not index fund context, but instructive). Obviously, as with all things legal, the more you tweak the facts, the closer (or farther) you can get from what initially seems like the only sensible answer. With Target Date Funds, we are far from that line. Even the most aggressive (2045, 2055) max out at around 90% stocks, so there’s always around 10% bonds. Plus, the stock basket will always be diversified internationally, whereas the ETFs we trade at Betterment are broken out by domestic, developed and emerging. So potential overlap goes down even further. Plus, there is the nature of the TDF to consider. “Substantially identical” is more than correlation: all kinds of factors might be taken into account to determine whether a security is “different enough”: issuer, expense ratio, market cap/liquidity etc. A TDF has an internal glide path, and if you keep holding it, it will gradually change into something else (based on someone else’s determinations). In that sense, it is an “actively managed” product – not with the bad connotation. It’s a portfolio of index funds (kind of like a Betterment account). That’s a radically different instrument from a single index fund. Did you ever actually move any money to Betterment? If so, what do you think so far? I’ve never tried TLH before so this might be a naive question. If I sell just enough to hit the $3000 loss mark, wait 30 days and buy back the same stock (or any other equity), the primary disadvantage is that the proceeds from the sale are out of the market for those 30 days, correct? There might be some leg work involved, but with limit orders, one could easily automate this to some extent I would think. Plus if I take in a larger loss, this process might not be needed for the year/s after. How does an algorithm with .15% commission substantially outperform the above method? Is it primarily targeted towards hands-off investors with substantial net worth? I like the idea of tax loss harvesting, but I think the wash sale rule in external accounts makes it less appealing than I first thought. Currently I have all of my 401k in an equity index fund (that I’m sure would overlap with Betterment’s funds). This has an expense ratio of 0.04%. In order to avoid a wash sale in my taxable Betterment account, I would have to move all my 401k to a “Target Retirement” fund like they recommend. However, the “Target Retirement” fund has an expense ratio of 0.64%. Assuming all else is the same and I can’t predict the relative outcomes of each fund, then I am effectively paying an extra 0.60% expense ratio in my 401k to go after the possible TLH+ gains in my taxable account. Add to that the 0.15-0.25% expense ratio charged by Betterment and then I am close to negative territory if I assume that TLH+ gives me an average of 0.77% better yield as advertised. This is also assuming the value of both accounts are similar. Am I making any mistakes here? I looked really hard at transferring my taxable accounts, but this point has made me balk. One thing that has bugged me about Betterment is that I feel like sometimes the algorithm sells funds too early, before a large drop, and I also feel like it isn’t smart enough to avoid the dividend. A lot of these TLH pairs have different dividend dates and the software could plan ahead to hold the fund long enough to make sure the dividends it receives are qualified or to time the exchange right to avoid the dividend altogether. The only decent option in my 401k is VIIIX. No target dates, no other index funds, just a bunch of high-fee actively managed funds. I kid you not. The dividends are automatically reinvested as required by the plan. My interest in Betterment is for the tax-loss harvesting. How might Betterment work in my situation? I have a serious question about the TLH+ feature that’s more specific to the transactions costs. When you trade a mutual fund the transactions costs are borne by the fund, hence why Vanguard has some purchase and redemption fees on less liquid asset classes. If there’s frequent trading of the ETFs, you are incurring the bid ask spread each time you trade. For large ETFs like VTI, VWO, this should amount to 0.01% or less because of the high volume. However, sometimes the bid ask can be wider like with VBR or other ETFs that they use. If they’re truly looking for tax loss harvesting every day, unless the algorithm is really that sophisticated then you might rack up some serious hidden transactions fees in the form of reduced performance for the account compared to a buy and hold approach not incurring these trading fees. So there could be 0.77% in extra performance thanks to tax savings but you could also cost yourself a similar amount in incurring bid ask spreads if you’re trading all the time. Because you have to wait 30 days I imagine you’re looking at maybe 2-3 trades a year for each ETF in the portfolio? So that would be about 10bps in lost performance in exchange for the tax savings? It’d be helpful to hear more from Betterment on this. I don’t think most people understand how ETF market makers make money in the bid ask spread. Those institutions are separate from Betterment. Great comment, and something I have also been wondering… Anyone have an answer to this? I don’t thinki they do loss-harvesting everyday. As of June 2017, they did no loss harvesting on my account ($120k+) during 2017, even though the market experienced ups and downs. Would love to see an update on how this worked out for you for 2015, albeit only 3-4 months. thanks! Thanks for this!! Based on this post I decided to experiment with betterment for my taxable funds this year. If it looks good, I’ll consider moving over the rest of my taxable accounts. Happy to say that I opened the account a few weeks ago and just got notice if my first $54 in tax loss harvesting. Fun! Do you think it’s still worthwhile to keep an account with Betterment now that they will charge a flat fee of 0.25% on all accounts up to $2 million? I’m new to tax-loss harvesting, so I felt more comfortable paying 0.15% fee to have a robo-investor do the work. However, with the fee increasing to 0.25% I’m reconsidering whether it’s worth it or not. Last year, I moved 120k from my Vanguard taxable account to Betterment since the fee was 0.15% for accounts greater than 100k. Now, I’m thinking about moving the money back to Vanguard due to the new higher fee. I want to avoid any capital gains, so I’m not sure what’s the best way to move it back to Vanguard without incurring more fees or tax consequences. It’s not worth it. It’s easy to do the tax-loss harvesting on your own once per year, at the end of the year. I just started moving out my money from Betterment to Vanguard after reading more about the investment. I think Betterment is great for people know little about what they are buying. However once I start reading more about investing (e.g., Bogleheads investment guide), I’m confident to achieve the same financial goal by managing the portfolio on my own with greater simplicity and less fee.